Dmitry G. Levitsky, who lived in the time of Catherine II, was a master of the so-called “ceremonial portraits”, where models were depicted in all the splendor of ceremonial clothes and regalia. In such works, everything is carefully verified – and the pose of the person portrayed, and the look, and the suit, and, of course, the background. As for the expressiveness of the model’s face, there could not be paid much attention to the transfer of the real character of the person you draw. But although the artist carefully treated the image of all the attributes appropriate to such a portrait, behind all this he did not forget to show the features of the person he depicted. At first glance, the portrait of the famous industrialist and philanthropist Procopius Akinfievich Demidov contradicts the whole concept of a ceremonial portrait – the one portrayed is depicted not in a ceremonial dress with many orders, but in simple (for a rich person, of course) home clothes. A shirt with a vest, pantaloons, stockings, simple black shoes, a velvet robe, a cap and a scarf wrapped around the neck carelessly. 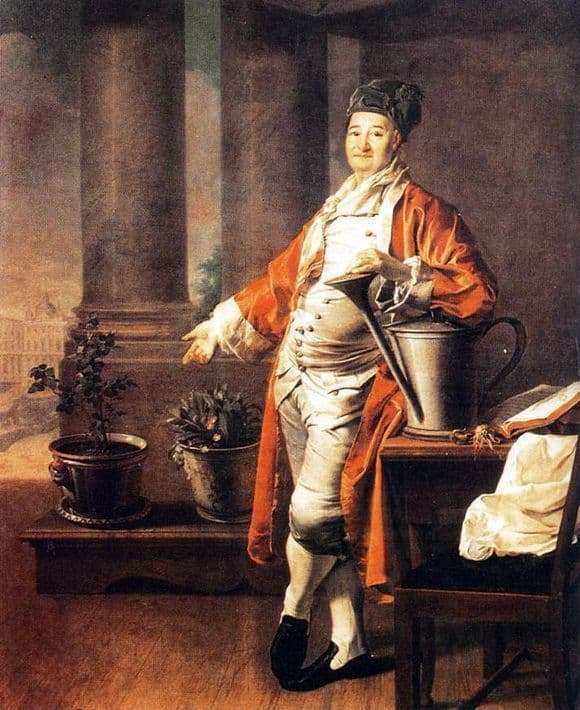 The pose of Demidov at the same time is the one that should be in the front portrait – he stands majestically, leaning his left hand on the large iron watering can, and his right hand solemnly indicates standing next to pots of flowers. Details on the canvas do not speak about the regalia of Demidov, who, by the way, has never been in the civil service, but about his personal interests and passions. Pots with plants, bulbs on the table, watering can indicate Demidov’s love for gardening – he had a whole botanical garden at his home, and the industrialist himself liked to collect herbariums. The background of the portrait was made in the best traditions of the parade – draperies, Greek columns, an impressive building of the Educational House, to which Demidov donated a considerable amount of money. Demidov’s facial expression is devoid of pomp and pomp – he looks at the viewer with irony and skepticism. All this speaks of the undoubted talent of the painter, the ability to penetrate the external attributes and reveal to the world the humanity of the characters in his paintings.